I believe in a fair price for a fair service, and base my rates on that belief. For a free, no obligation estimate, please contact me. When installing software or hardware, I require that you purchase the materials. If you would like me to purchase materials on your behalf in preparation for a project, I pass those costs on to you without mark-up, but prepayment for those materials is required. For many projects, including data restoration, I also offer "Project Rates" because these projects tend to be time-intensive, but not labor-intensive. In other words, I don't expect you to pay me to sit and watch the computer work. My Project Rate is set on a sliding scale based on the size of the drive and nature of the project. Please contact me to discuss whether a project rate is right for you. If you find yourself in need of ongoing service, I also offer customized service on a contractual basis. Please contact me directly and I will work with you to tailor a contract that is appropriate and fair. 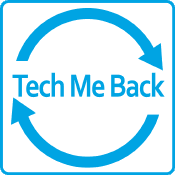 Tech Me Back accepts local, personal checks as well as all major credit cards, and PayPal. To pay via credit card, regardless of whether you have a PayPal account or not, please click on the “Pay Now” button below. If you would prefer, you can pay your invoice through online bill pay from your bank. Simply set up "Tech Me Back" as a payee, and use the address on the “Contact Me" page as the delivery address for your payment.